Home→ADVENTURE TRAVEL→Outdoors→The Whitsundays New Resorts. After the rain, comes the rainbow. 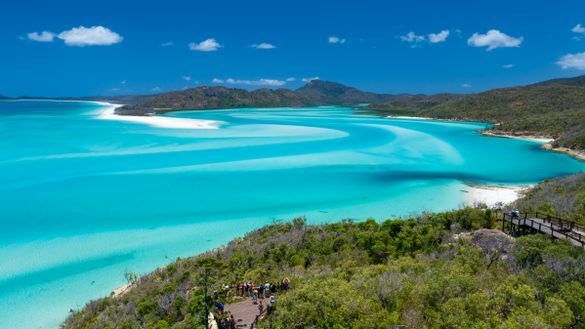 And in this case, the pot of gold can be found in the 74 islands throughout the Whitsundays as they get set to make the ultimate comeback in 2019. April 10 sees the much-anticipated opening of Daydream Island Resort followed by the reopening of the iconic Intercontinental Hayman Island Resort on July 1. It’s all part of a masterplan to polish Australia’s favourite island resort destination following the devastating weather events of 2017. The Cinderella effect of Airlie Beach continues with the re-opening of the hugely popular Airlie Beach Hotel in August 2018 following extensive refurbishment, a $6 million revamp of Blue Horizon Resort, a $5 million overhaul of at Waters Edge Resort and a $1.6 million retread to Coral Sea Resort and Beach Houses. Not to be left out, the family friendly BIG 4 Adventure Whitsundays, which celebrated 25 Years of ownership last year, unveiled seven new two-bedroom cabins in time for Christmas, while Mirage Whitsundays opened an in-house restaurant and spa, plugging a much-needed pamper gap around Shingley Beach. Heart Reef Pontoon: Designed exclusively for small groups arriving by helicopter, the all new Heart Reef Pontoon provides a three-hour reef experience including a glass bottom boat tour of Heart Reef Lagoon, all snorkeling equipment, light catering, sparkling wine and water. Whitsunday Gold Coffee: Australia’s largest coffee plantation returns after extensive refurbishment and redevelopment, showcasing the whole coffee process, from bean to roast to grind to cup. The site will house one of the biggest under indoor children’s play areas in the Whitsunday region. Construction of The Shute Harbour Restoration started March 2019 and features a new seawall, a two-floor terminal with views over the water, café facilities, a new carpark, new public amenities, landscaping and three finger pontoon jetties, including a designated recreational fishing pontoon. The $6.3 million Airlie Beach Foreshore Revitalisation will create a high-quality seaside community hub with a Skywalk playground and multi-level Pirate Ship, two Sky Cabins, and three gigantic slides. The Revitalisation als includes 120 market stall sites, sound stage, new shaded umbrellas and landscaped gardens. A Haselwood Island Lookout started late 2018 will add a shiny new vantage point to this Hollywood backdrop (Haselwood Island was a pivotal scene for Pirates of the Carribean: Dead Men Tell No Tales) and will add to the two platforms at Hill Inlet Lookout. The northern towns of Proserpine and Bowen have benefited from the opening of a $1.7 million a new recreation centre with exciting water sports features, new accessible jetties, camping facilities right near Lake Proserpine, where ‘glamping’ cabins are being created. 2019 will also see two new walks, as well as several restored tracks, to the region. The new walking track at picturesque Border Island follows a steep ascent from Cateran Bay before meandering along the island’s saddle to enjoy postcard worthy views. Meanwhile, the camping area at Whitehaven Beach is undergoing major upgrades and will provide a superb based for a 20km long-distance walking track to the summit of Whitsunday Craig, the fourth highest peak on the island.